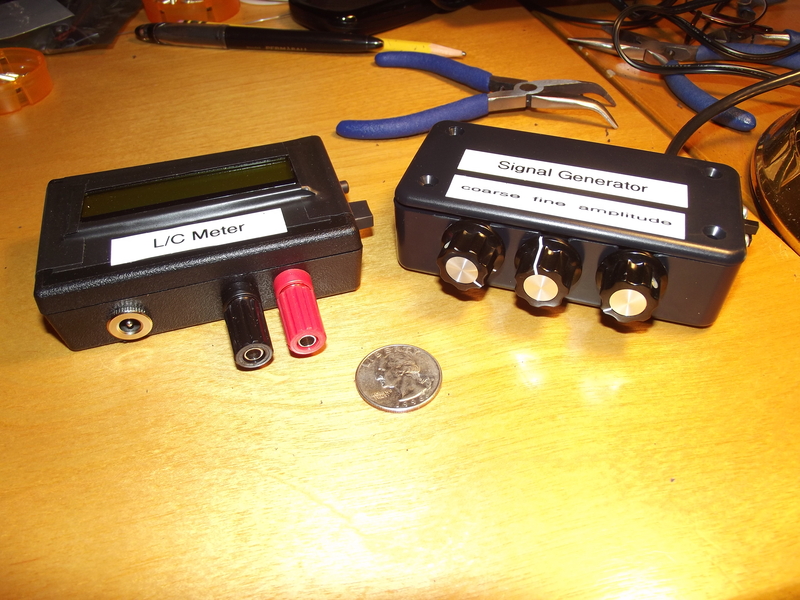 After building the “Accurate LC Meter Kit” from Electronics-DIY.com, I turned to their “1Hz – 2MHz XR2206 Function Generator Kit”. All parts necessary to complete the kit were included, though not exactly as pictured on their webpage — two of the WIMA capacitors had been replaced with substitutes and there was no IC socket. All components were through-hole; soldering the kit together went quickly and easily. If you build one of these kits you’ll need to provide your own power source as well as your own pin-connectors (if you choose to use the pins provided). As with the LC Meter, I used a size M coaxial DC power jack to accept a plug from one of the wall-wart power supplies I have around here. I didn’t bother to install a power switch in either unit since I won’t be using them very often; I won’t leave them plugged in between uses. The fellow at the local Radio Shack gave me some pin-connectors for free, clipping them off of some battery packs that were in a box for recycling, though he only had two-pin connectors. Since one of the pin-sets has three pins, I just soldered a piece of hookup-wire to the third pin. If I had to do it all over again, I wouldn’t bother with these pins — I’d just solder hookup wire right to the PCB. By the way, if you ever try soldering to a pin make sure you clip a heat-sink to the pin before heating it up. The plastic base of those pins melts pretty quickly! I chose a plastic project box from Radio Shack to house this function generator. Using a Dremel tool with an engraving cutter (at the lowest speed — 5,000 RPM), I put three notches in one side of the box for the potentiometers, a notch on one end for the two switches, and ground down all four stanchions on the floor of the box since otherwise the potentiometers would have extended too high to allow the lid to fit. That Dremel tool sure is handy! A few knobs from Radio Shack finished off the project. The two outboard switches allow you to select between three waveforms — sine, triangle, and square. I don’t have an oscilloscope so I can’t tell you how the waveforms look, but I can at least tell you that the sine wave sounded pure when I hooked my headphones up to the output with a matching pad. I am pleased to report that the signal generated by this function generator is very stable. Four DIP switches on the PCB allow you to select between four frequency-ranges, and two potentiometers allow you to tune within the selected range. One of these two potentiometers provides coarse tuning, and the other provides fine tuning. The third potentiometer controls the amplitude of the signal generated (note: amplitude decreases as you turn this potentiometer clockwise). If you build this kit you’ll want to hook it up to a frequency counter. Two pads on the PCB are provided for this purpose. I have a piece of coax hanging out of the back of the box for connection to my own frequency counter — not that you have to use coax, but it was handy for terminating with a BNC connector. (If I were really classy I would have put this coax through its own hole in the project box, but hey, this is a piece of test equipment — I just ran it through the big hole I made for the RCA connector.) When I hooked up my frequency counter I noticed that the published ranges for each DIP switch were just rough approximations, but I was pleased to see that this frequency generator covered the entire published range and more — up to about 2.4 MHz, if I recall correctly. The source impedance of the generator is 600 ohms and the output is intended to be terminated in a 600-ohm load. In my next post, I hope to discuss the construction of a minimum-loss matching pad to hook it up to a piece of equipment that has a different input impedance. Update (6/1/12): Not having heard back from electronics-diy.com, on 5/29/12 I inquired by email about the assembled kit I returned. The next day I received this reply: “We have done a range of tests on your LC Meter kit and have found no problems. Both capacitance and inductance measurements are identical to our kit. We even used brand new microcontroller chip and the readings are the same. Per your request we can either ship the kit back to you, or if you are not fully happy with it offer full refund.” I asked for a full refund, which they promptly granted (minus $5 shipping that I initially saved when placing an order over $99, but now have been charged since my return brings that order under $99). Update (3/7/12): Yesterday I prompted support@electronics-diy.com for a reply, mentioning the number of pageviews this post has received. I received a prompt and polite response. I learned that I was mistaken in expecting the meter to read capacitors 1 uF or higher, since the published range of the meter is only 0.1pF-900nF. There was no explanation of why I am having problems with inductors that are within the published range of the meter. However, I was quite favorably impressed by an offer to test and fix the kit at no extra charge! I shall take them up on this offer and keep you updated. Update (2/8/12): I am having trouble with this LC Meter. It gives me the same reading for all capacitors 1 uF or higher, and the same reading for all inductors higher than about 70 mH (this last value is just a guess): 838.8 nF and 83.88 mH, respectively. As you can see the digits are the same. It seems to work for really small capacitors and inductors, but anything bigger and these are the only readings I get. I emailed support@electronics-diy.com on 1/8/12 about this, but as of 2/8/12 I have received no reply. Unless and until I learn the problem is due to some error of my own in constructing this kit, I recommend against purchasing it. 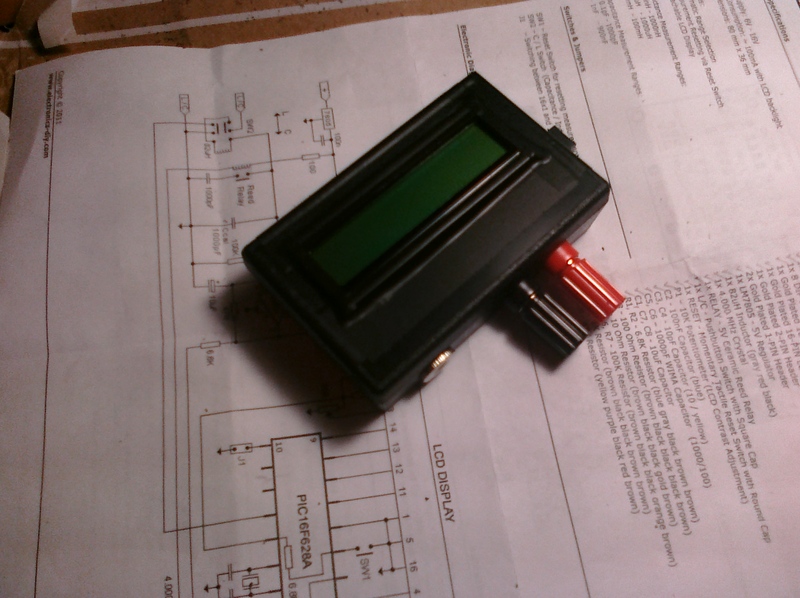 Yesterday evening I finished building the “Special Edition Accurate LC Meter Kit with Blue Backlight LCD”, available from Electronics-DIY.com for $69.95. I have no experience with such devices; a more experienced fellow told me he was impressed by its specifications, so I ordered the kit. Soldering it up was a snap. The main printed circuit-board is all through-hole construction, and the LCD-board that mounts over the top of it requires nothing but a connector. If you want to build one of these you may want to order this version of the kit instead of the one I purchased: Accurate LC Meter Kit with Green Backlight LCD, for $59.95. My kit’s “Blue Backlight LCD” turned out to be green anyway, and I think the two kits have the same circuit, save an adjustable potentiometer on mine that controls the contrast of the LCD (which I just set to maximum anyway). Certainly the cheap case that comes with the kit I ordered is not worth the extra $10 — to use it you have to carve out a bunch of stuff (to make room for the circuit-boards), including two of the four stanchions that attach to the lid. After going to all that trouble (I used a Dremel tool) you are left with a case that requires adhesive tape to hold down one side of the lid! You’ll need to supply your own power to this unit. There isn’t enough room in the case for a 9V battery, so I purchased a DC socket. You’ll also need to supply your own connectors for testing inductors and capacitors; the photograph on the Electronics-DIY.com website shows them in the case, but they aren’t supplied. I used banana-plug sockets. You’ll also need to supply your own pin-connectors if you use the supplied pins on the circuit-board, and you’ll need your own stand-offs if you want to support the LCD-board (only two of the four screw-holes match up with the lower PCB, but that’s probably good enough). There is no way to select the units displayed on the screen, e.g. pF vs. nF. But the dearth of selector switches is actually one of the nice things about this unit. There is no need to select a range of capacitances or inductances. The only thing you have to do is plug it in, hit the reset button whenever you want to calibrate it, and stick in a capacitor to get a reading. If you want to test an inductor, you simply press one button to select inductance-mode, then attach your inductor. It just works — and it works with precision. Here is a slideshow of some snapshots that I took with my cell-phone. They didn’t turn out very well, but they’re good enough to give you an idea of what it looks like. Notice that I used black electrical tape to mask the edges around the LCD. That’s because the opening I made was downright ugly. Next time I’ll try using a cutting wheel on my Dremel tool instead of a grinding tip! I’m afraid I haven’t spend much time on the air lately, because what time I have for ham radio has been devoted to a project that began as an idea for a blog post and has grown . . . and grown . . . and grown! I hope to write it all up when everything comes together, but I don’t want to give it away just yet. For now I’ll just give you a few clues: I’ve been assembling some test equipment, including an inductance-capacitance meter kit and a signal generator kit, and I received a tantalizing shipment in the mail today from a fellow who wrote a stellar article in QST 31 years ago. Stay tuned! On another front, I finally got to meet a local ham who is the IT manager at the hospital in our small town (population ~3K) — Mr. Andrew Rosenau, KCØYFY. I’ve been meaning to introduce myself to him ever since moving out here, but when I found out a few days ago that he is our county’s ARES® (Amateur Radio Emergency Services®) Emergency Coordinator, I sent him an email right away. He replied immediately, and today, after wrapping up a meeting in another part of the hospital, I ambled over and chatted with him for a few minutes in his office. Behind him on his desk sat an HF rig, a 2M rig, and a TNC. Andy explained that he was a ham before moving here, and he got involved with ARES® when the hospital became interested in EmComm. But with so few hams in our area (only 14 in the whole county), there hasn’t been much in the way of ARES® activity. I volunteered to do what I could, and he said that for starters I could act as a back-up operator there at his station if he were unavailable in time of need. It turns out that Minnesota has a huge packet network, and a radio club in a nearby town has even installed an antenna right in our city to extend this network. That was news to me! I’m going to have to dig up my old TNC and see if I can get it running. As much as I prefer CW, I have to admit that it does seem like an excellent way to handle traffic in an emergency. ARES® has always interested me. I’ve never been involved in it before, back when I lived in the Twin Cities, but now I think I owe it to my community. It appears that while there is less opportunity to do much ARES® work out here in the sticks, there is also more opportunity for one ham to make a difference. So far Andy has been all alone in his effort — if even one ham chips in, that would double the number of ARES® operators in our county. Andy’s wife is a ham, too! I hope to have them over for dinner one of these days and get to know them better. 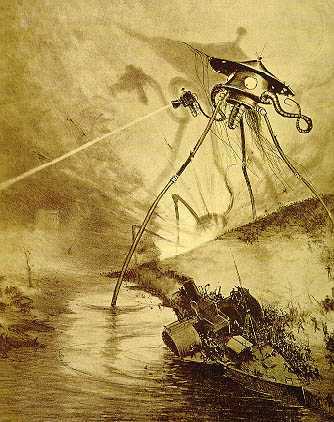 For some time now I’ve been nibbling away at H. G. Wells’ book, War of the Worlds — in CW! It is available along with several other books at the SKCC CW Learning Page. What a blast! It’s an effective way to improve your code speed, and it is so captivating that you want to keep coming back to it to find out what happens next. Somehow the story is all the more gripping as it unfolds slowly, letter by letter, giving you ample time to imagine the scenes that Wells describes. Each chapter is one word-per-minute faster than the last one. So while it starts at a mere 10 WPM, if you finish the book you’ll be copying 36 WPM! A couple other features are helpful, too. For one thing it has punctuation marks that I’ve never learned before. It’s not everyday that you hear hyphens on the air, and the first time you hear an apostrophe or quotation-mark it will throw you for a loop. But you learn them quickly enough. Another thing I like is that Wells uses some expressions that are a bit antiquated. This helps keep you on your toes. On the air, it can be a help to anticipate the next word, but it can also be a hindrance — if you don’t hear what you expect to hear, it can take just enough milliseconds to get over the surprise that the whole word “rushes by like a freight train” (as my friend Keith describes code when it suddenly becomes opaque). 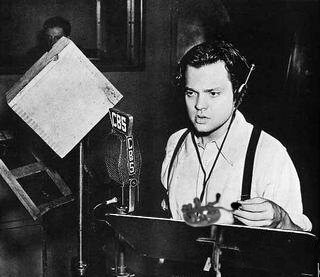 By listening to War of the Worlds on CW, with its occasionally unfamiliar turns of phrase, you learn to temper your expectation so that you’re not thrown off. All in all it’s a great way to hone your skills, and it’s way more enjoyable than the dry practice tapes I listened to ‘way back when! Thank you to SKCC and especially to John Dunlap, KF7BYU, for making this book available! Update: One ham has asked me for help on this. Currently the only way to listen to the files at http://www.skccgroup.com/learn/learn.php is to click on them one at a time, either listening to them one at a time online or right-clicking each one and saving them one at a time to put together in a playlist on your computer (That’s what I did, and it was a bit tedious.). If you would like to download a zipped file of the whole book, send me an email at N0IP@arrl.net and I’ll give you the link for as long as I can spare the disk space to keep the zipped file online.